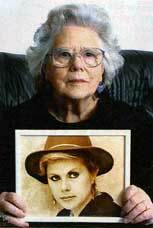 Kirsty MacColl was a much loved English singer and songwriter who was killed by a power boat at the age of 41 whilst scuba diving with her sons in a restricted diving area off Cozumel, México on 18th December 2000. No-one was ever made accountable to the satisfaction of her family and friends. This website was retired in 2015, for continued reference please consult the Justice for Kirsty Campaign page at kirstymaccoll.com. The campaign’s history will be available there indefinitely. Sadly Jean MacColl passed away on 16th May 2017.